Marriage is an alliance of two hearts, two souls and two conscious beings. This pristine association makes the two persons live together for a lifetime. 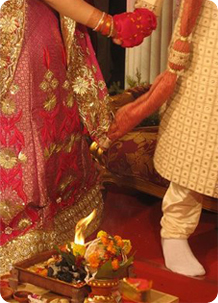 Astrology for marriage proves to be very useful for the upcoming life of married couple. Wedding is an utmost beautiful phase, which everyone craves to experience. It is obvious to have certain questions regarding your beloved, married life, compatibility factor etc which might take birth in your heart time to time. * When will you get married? * Are you worried for your married life? * Will you have a love marriage or an arranged marriage? * Will you get a divorce? * Will your engagement survive? * Will you remain a bachelor from cradle to grave? * Is your husband/wife faithful towards you? Above - mentioned questions are taken out from the everyday queries we receive. You can also put up any questions or confusion pertaining to marriage, which you think you should ask. A marriage report covers all your doubts and dilemmas for marriage. Our marriage horoscope readers or the marriage astrology experts will provide you with complete analysis, which explains the reason behind your problems before and after marriage. For some the problem remains for finding the right match, and for some the problem remains to adjust with their spouse after marriage. The marriage report is buy for a successful and happy married life.